In our continuing series, BNSF, Along the Route of the Santa Fe, videographer Kenn Oberneder takes us on a journey across eastern New Mexico capturing fast train action on BNSF's Clovis Subdivision. Starting at the crew change town of Belen, you will see awesome train movements on one of the busiest main lines in North America. Our tour will take us through the vast open spaces in eastern New Mexico along with the newly double tracked section of Abo Canyon. Our tour ends at the eastern terminus of the subdivision at Clovis, near the Texas border. Intermodal trains dominate this line, but for the freight and unit train fans, there is something for you too! Coal, ethanol, grain and general freight can be seen polishing the rails through such towns as Mountainair, Vaughn, Yeso, Fort Sumner and more! 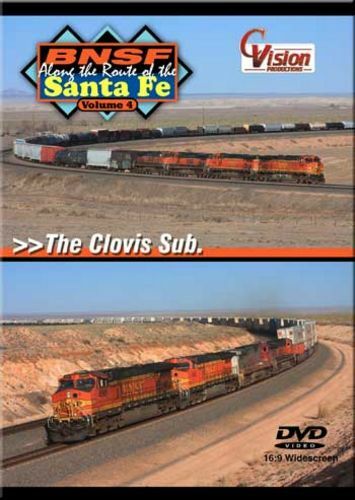 Long sweeping curves, sunrises, sunsets and trains traversing a spring time dust storm are all captured in BNSF, Along the Route of the Santa Fe, Volume 4 �The Clovis Sub�! Most of the DVDs from this producer are not shrink-wrapped, but they do include a security seal either on the top or all three sides of the case.